Sugar Hill is sleepy Atlanta suburb in Northern Georgia. It's also the namesake for Mike O'Rourke's newly produced BBQ sauce. The Georgia native's sauce is a blend based on childhood memories of the tangy vinegar dip used by the local smokehouse as well as the sweet, tomato based recipe that his mother brewed at home. The result is a medium / thin red sauce that's both sweet and tangy (as stated on the label). Sugar Hill Smokehouse BBQ Sauce is packaged in standard 16 oz. glass bottles. The label / logo is simple, but appealing. Like many Georgia sauces, Sugar Hill Smokehouse also includes a fair amount of mustard. This balances the sweetness and adds to the tang. The all natural sauce is sweetened with sugar and molasses (no HFCS). The spices / seasonings include the usual suspects. I first used Sugar Hill as a finishing glaze for two nicely trimmed racks of St. Louis ribs. The sauce looked fantastic on the racks. It brushed on smoothly and created a great glossy shine. The color darkened just a bit under the heat, giving the ribs a magnificent mahogany bark. The flavor of the sauce held up well to the heat. It lost a bit of tang, but a hint of mustard was still evident. The sugars got richer and deeper which complimented the salty rub and smokey meat. The sauce made the each bone appropriately sweet and sticky. I later poured Sugar Hill Sweet & Tangy over a mound of smoked pork shoulder. I love tossing smoked pork into medium/thin tangy sauces. Sugar Hill proved to be a perfect BBQ sandwich sauce. It's thin enough to penetrate every piece of pulled pork, but thick enough to stand on it's own and be poured over the sandwich. Sugar Hill Smokehouse Sweet & Tangy is great because of it's versatility. It's the style of sauce I constantly have on hand. It's suitable for nearly any BBQ application. Additionally, since it doesn't feature any real extreme flavors, it's the type of sauce that nearly everyone will enjoy. Pick up a bottle of this delightful sauce Here. 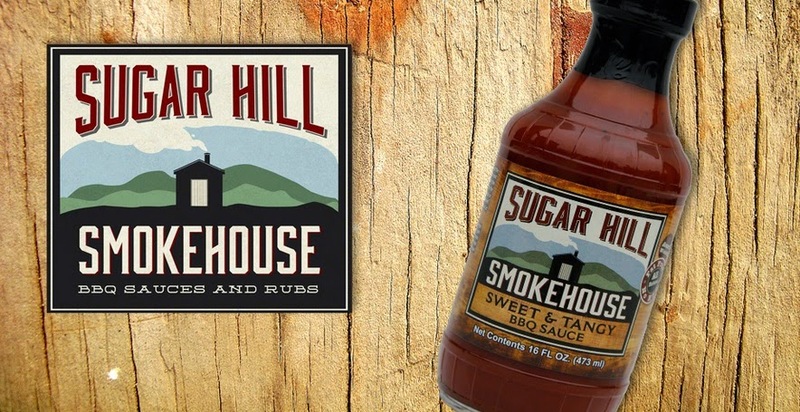 1 Response to "Sugar Hill Smoke House Sweet & Tangy BBQ Sauce"